How well do you know your neighbors, really know them? It is highly unlikely that you know all there is to know about them. Everyone carries secrets and baggage along with them. Infidelities, drugs, secret drinking, even a criminal. You just never know. Human nature being what it is, people will only share so much with each other. That is the premise in The Perfect Neighbors. Kelli Scott, Susan Barrett, Gigi Kennedy and new arrival Tess all live in the perfect cul-de-sac. This community even has the Newport Cove Listserv, where community members can email to each other their complaints or news. I thought that these little snippets at the beginning of the chapters added a bit of humor to the story. Kelli has gone back to work after being a stay at home mom. Working in a real estate office alongside a handsome coworker challenges who she is and her relationship with her husband. Susan is dealing with her ex-husband, Randall, and his new soon to be wife, Daphne. Susan and Daphne had been good friends with Susan but at first, Susan did not know that Daphne was the one having an affair with her husband and Daphne did not know that Susan was Randall's wife. Susan has taken to lurking outside Randall's home To add fuel to the flame, Daphne turns up pregnant. Gigi's husband is running for Congress, they have a daughter who has started hanging around with a bad crowd, becoming more moody and angry with her mother. Dealing with a political campaign has its own set of headaches. Then there is the new neighbor, Tessa. Her secret can bring about the ruin of everything that Tessa holds dear. A secret so horrible that Tessa is very withdrawn from her neighbors. So does socialize a bit but holds herself back from the others, not wanting to get too close. 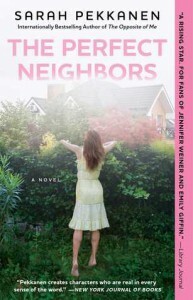 The Perfect Neighbors is a very good book, each chapter is told by each of the four women letting the reader get inside the lives of each one of them. We see behind the facade that each of the women have so carefully put up. I thought it was a great page turner. I read it in a few sittings. I highly recommend it.